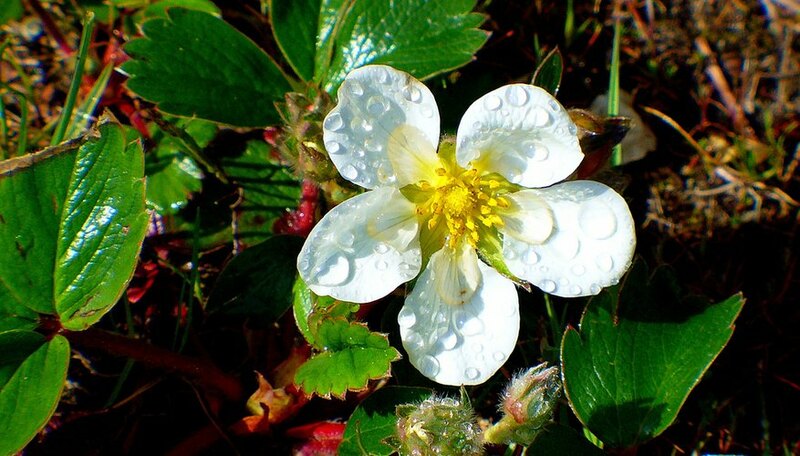 Pacific beach strawberry (Fragaria chiloensis) is also known as the beach strawberry, native strawberry or coast strawberry. It grows in Alaska, Hawaii, coastal California, Canada and South America. It is often used as ground cover because of its quick growth, and it can be harvested and eaten. The Pacific beach strawberry provides more berries than the wood strawberry. Find a location with full sun or light shade and quick draining soil. Provide enough room for 12 to 18 inches space between plants. Prepare soil ahead of planting in fall. Test soil if desired, aiming for a pH level from 5.8 to 7.8. Garden fertilizer or a mixture of manure and compost can be added to enrich soil. Use a rototiller or shovel and hoe to cultivate top several inches of soil. Add fertilizer (if needed) to top layer of soil. Choose plants specific for your location or modified for the area. Buy plants no more than two or three days before planting. Using a hand trowel, dig a hole slightly bigger than the container holding your plant. Gently remove the plant from its container and place in the hole. Fill the area around the plant with soil. Press down on soil with your hand to get rid of any air pockets. Repeat for each plant. Water the newly planted strawberries thoroughly to remove any remaining air pockets in soil. Water every two or three days, if rainfall is not sufficient, until the plants are well established. Use a shovel to add mulch around area of planting to help moisture retention in soil and to deter weeds. Otherwise, remove weeds by hand. This will only be required immediately after planting; as plants thrive, weeds will not. Remove any runners appearing outside of designated growing area. Use a hand trowel to dig them up. Plant the runners you removed in other locations or in pots to use later in the year or for patch renovation. Place in pots and cover roots and stems with soil. Many types of Pacific beach strawberries are drought-tolerant and do not require much water to thrive. Pacific beach strawberry patches need to be renovated every three to four years. This supplies higher-quality plants and better yields.